International science, engineering, and architecture consulting firm Kleinfelder will be opening its first dedicated and permanent Canadian office in Calgary. A 100 per cent employee-owned company with more than 50 years of experience, Kleinfelder provides planning, engineering, and management solutions for infrastructure and natural resource challenges. The tallest office tower in Calgary has made Emporis’s list of most impressive corporate buildings from around the world. Designed by Foster+Partners, the Bow is the corporate headquarters for EnCana, a Canadian petroleum and gas producer. 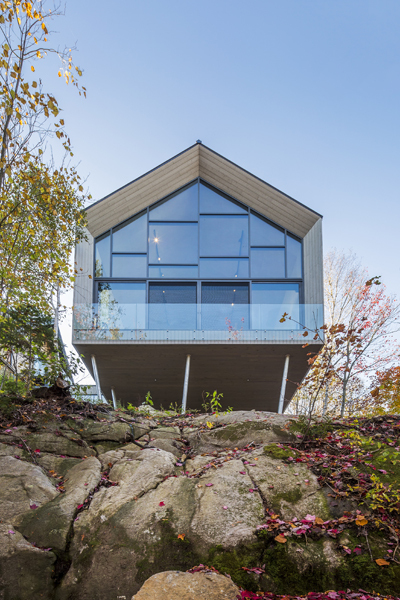 Designed by MU Architecture, Workshop on a Cliff is a 464.5-m2 (5000-sf) wood structure resting on a set of inclined columns in Québec. 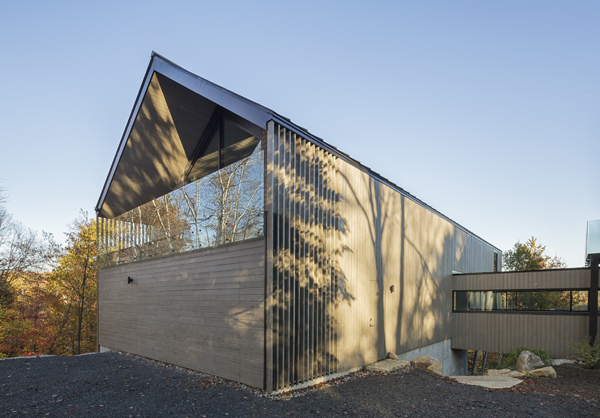 Located in the Laurentians’ mountainous countryside, in the province of Québec, Workshop on a Cliff is not a typical garage. Reminiscent of a barn, this minimalist wood volume over Lake Deauville stands out from the surrounding green mountains. Designed by MU Architecture, Workshop on a Cliff covers more than 464.5 m2 (5000 sf) and houses two superimposed garages, a workshop, a large creative room, and a mezzanine. Connected to the main residence by a cantilevered bridge, the Workshop rests on a set of inclined columns. The Workshop is presented as a simple volume covered with a pre-aged grey wood. Its thick exterior walls take from the standards of Passive House constructions. Sophisticated details were developed to ventilate the building between the walls and the roof and to completely conceal the garage door. It houses two superimposed garages, a workshop, a large creative room, and a mezzanine. Pierced with light on its flanks, the studio is oriented toward the North. Spacious but intimate, the interior volume accommodates large formats of paintings. The minimalist play of surfaces and the rigour of the alignments put the artist’s work in scene and supports his concentration. The mezzanine offers a relaxation and play area under a large uninterrupted ceiling. A smaller house-like volume in its centre shelters a bathroom and another smaller mezzanine set even higher is a perfect hideout for children. On this aerial platform, the polished concrete floor reflects light. It is accessed by an open staircase consisting of large plates of cold-rolled steel. The staircase connects the bridge and the mezzanine.